These creatures are the basis of most dungeons found below the Eighth. Unlike the roaches found aboveground, these ones are much greater in size, and have an uncontrollable appetite for abovegrounder flesh. Roaches are most deadly when in hordes. When roaches appear in more than two touching rows, you will need to find some way to either lower the amount of rows, or find a secure area to kill them from. If they are coming in a straight line, you should be able to kill them at a right angle. Roaches determine which of their eight adjoining squares is closest to the player and attempt to move there (i.e. they make a direct bee-line for him). If that square is blocked horizontally or vertically, the roac does nothing. If the blocked move was diagonal, however, the roach will try to move vertically closer to the player and then horizontally closer. This results in the roach's ability to "slide" along walls. If neither horizontal or vertical movement is possible when blocked diagonally, it does nothing. 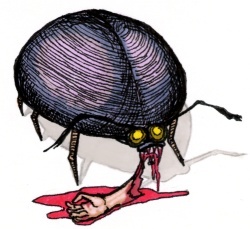 The roach's movement is blocked by deep and shallow water, walls, closed doors, orbs, bombs, mirrors, pits and potions. The brain considers the nine possible tiles that the monster can move to (including waiting in place) that do not contain visible obstacles. It then sorts them in order of distance. If there is a tie the move preference is: orthogonal moves first > waiting in its current square > and then the diagonal moves, with north-westerly moves taking precedence. The brain then orders the roach to move to the first square on the list; if it can't do so (because it is blocked by a invisible obstacle) it tries the second, and so on. If the brain does not give the roach an order, or if it orders it to wait, then the roach's own instinct kicks in and it tries to move towards the player as if it were unbrained, even if this includes moving over a brain-visible obstacle. Of course, if no path to you exists at all, then the it will also move as it would when unbrained. When brained, these monsters will still be drawn to decoys that are in range, but not to stalwarts/soldiers. They will kill stalwarts/soldiers, however, if that is the quickest path to get to the player.